Reid, I was looking at your website today. 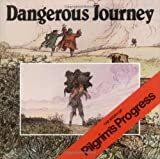 Wanted you to know about a great book that is an abridged version for kids of Pilgrims Progress. It is called Dangerous Journey, by Oliver Hunken. It is grafted from the original text and the illustrations are stunning and really help kids much younger appreciate the story. I read this book to my kids so many times we destroyed the book. My 23 year old asked me to read out loud last weekend. Anyway, thought you might enjoy this if you haven’t seen it before. Putting this one in the Amazon shopping cart today.